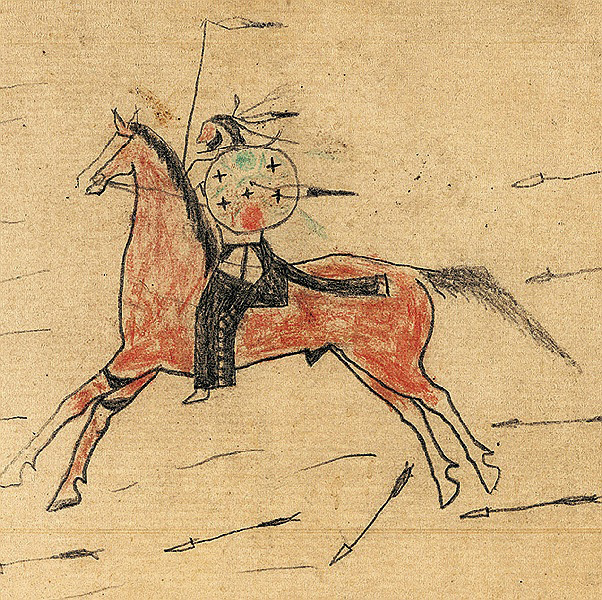 Drawings from Half Moon Ledger Book. Ms Am 233, Houghton Library, Harvard University. Gift of Harriet J. Bradbury, 1930. 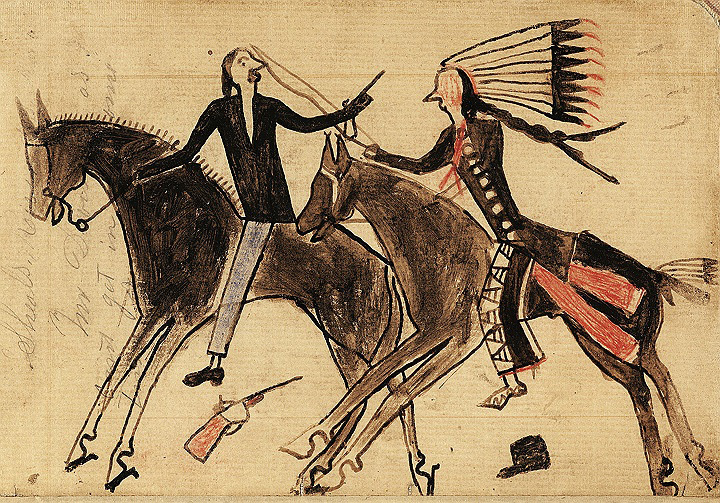 Lakota Sioux and Cheyenne warriors led by Sitting Bull annihilated Lieutenant Colonel George Armstrong Custer and the U.S. cavalrymen under his direct command at the Battle of the Little Big Horn in the Montana Territory on June 25, 1876. Allegedly found on the battlefield by fellow soldiers was an accounting ledger that had once belonged to goldminer J.S. Moore, reputedly killed by Half Moon in 1868. 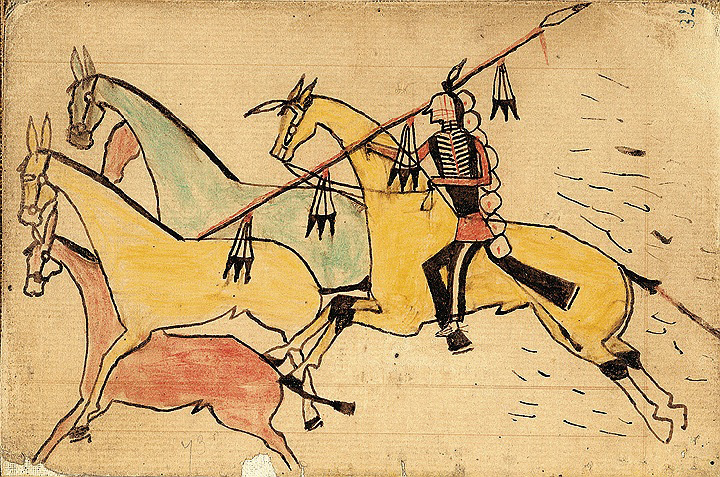 A group of at least five Lakota warriors had repurposed the ledger and, during ensuing years, filled its pages with 77 narrative drawings depicting their exploits. It became a rare visual history from an Indian perspective of the tumultuous decade before the battle, when Anglo-American expansion into the West touched off general conflict. Above, a warrior with a crescent moon painted on his face and celestial symbols on his shield gallops unscathed through a fusillade of arrows. The smaller images show: at left, a horseman under fire, wearing silver hair disks and a breastplate, capturing mules; and at right, an Indian striking a soldier with his bow in the bold ritual called counting coup (writing from the ledger’s first use is visible at left). Now McLaughlin and Lakota artist Butch Thunder Hawk have co-curated “Wiyohpiyata”: Lakota Images of the Contested West, a multimedia exhibition at the Peabody (see www.peabody.harvard.edu for details). It “experiments,” as she puts it, “with communicating ideas through ambient effects and installation art.” Look for historic objects such as a bonnet of golden-eagle feathers worn by Lakota warrior Rain in the Face. Look, too, for such contextualizing scene-setters as a vast, billowing ceiling banner on which Wayne Pruse of United Tribes College has airbrushed the winged beings who govern storms and warfare. Distant thunder rumbles.